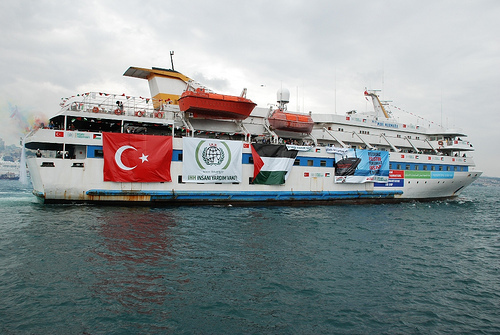 The Gaza flotilla clash occurred on 31 May 2010 in the international waters of the Mediterranean Sea, when Israeli naval forces seized a flotilla of six ships carrying international activists, known as the “Gaza Freedom Flotilla”, who were planning to break the Israeli blockade of Gaza and deliver humanitarian supplies. According to Israeli sources, their forces boarded the flotilla after it had declined to change its course to the port of Ashdod, where Israel had promised to inspect the aid and deliver non-banned items to Gaza. Jun 03 – Turkey: Can Turkish-Israeli relations be rebuilt? May 28 – Israel: The Freedom Flotilla – PR Stunt or Humanitarian Act? Sept 5, 2008 – Palestine: The siege of Gaza was broken – and then? Global Voices authors summarize and translate blogger reactions to this event in the Middle East and beyond. If you have links or suggestions, please contact Middle East and North Africa editor, Amira Al Hussaini.